Talwalkar’s – What is in a Name? Everything, apparently. “What is in a name?”, Shakespeare asked? Well, if he asked the question to investors who bought Talwalkar’s Better Value Fitness Ltd they might be like, “everything”. After the demerger, people who bought the stock thinking they are getting the Gym business now suddenly understand that they actually bought a company that will have all other businesses other than the Gym business. 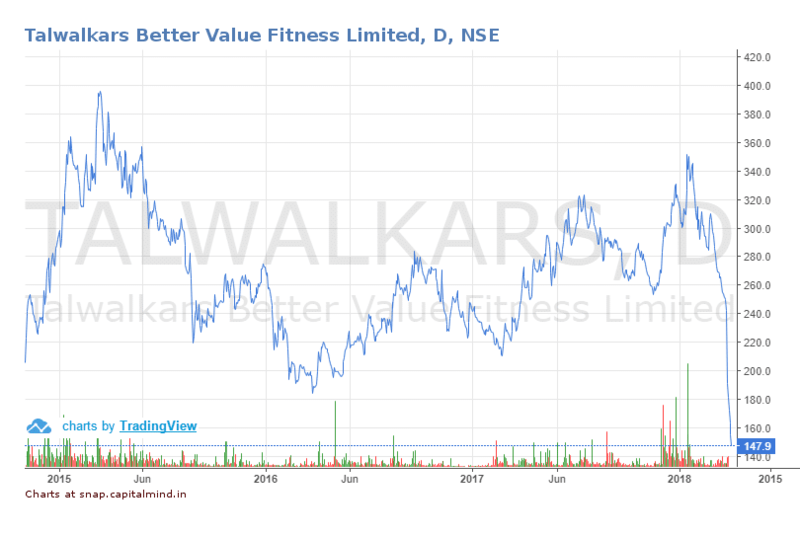 In 2010, when Talwalkar’s hit the market with an Initial Public Offer, there was great interest, especially given the fact that one of its investors was Laxmi Shivanand Mankekar. The issue was oversubscribed but returns for investors over time have turned out to be sub-optimal. The company quite a while back announced a plan to demerge the Gym business out of the existing company into a new company that initially will be named and listed as Talwalkar’s Lifestyles Ltd. Once the listing process is over, this NEW company’s name will change to Talwalkar’s Better Value Fitness Ltd, the old / original company’s name will become Talwalkar’s Lifestyles Ltd. Confused? Well, so seems to be the exchange too going by the way prices opened post the demerger. The new company has seen a transfer of 71.04% of the existing company’s assets with rest, 28.96%, remaining with the parent company. The stock closed on the last day before the ex-demerger-day at Rs.240.95. Theoretically, it should have opened at 28.96% of its value on the Next Day (i.e., somewhere near Rs.70). Instead, the stock price opened at 192 and closed the day at 182.40, a drop of 24.30%. Since then, the stock has been on a lower circuit with no signs of opening. This should continue till we reach the equilibrium stage of Rs.70 which is nearly 50% below the current prices. And for investors, it’s confusing. They thought Talwalkars with the “fitness” name was the gym. After the demerger, the gym went to the company that has “Lifestyle” in the name, and the lifestyle business stays in the listed company which has “fitness” in the name. The interchange of names will happen later, apparently. But till such time, the confusion remains. Demergers are “Special Situation” opportunities for those who can understand and analyse the business and can quickly take advantage of lapse of judgement from other uninformed investors. In this case though, the arbitrage for those who understood what was happening has been a lottery. Why didn’t exchanges resolve this? The fault though lies with the Exchanges who are supposed to take into account the ratio and set the prices correctly. When a company issues a Bonus or Splits its shares, the opening price of the stock is always closer to the actual ratio and even if you were to attempt to buy at a wrong ratio / price, the system disallows the same (thanks to bracket ranges Exchanges place on New Listings). The ratio wasn’t set right and the stock has then tanked. Lower circuits on every single day. This isn’t the first time such an incident has happened. The question though, is why Investors are penalized for no fault of them. While investors do understand that markets are inefficient, this is not one such scenario. It’s easy to say that investors should know. But in the end, if you allow such naming drama, you will eventually hurt the markets and the trust that people have in them.